E-coli, Cholera, Hepatitis A, Norwalk Virus, Enteric Viruses, Legionella, Giardia, Cryptosporidium, Entamoeba, and many more dangerous microorganisms! Stage 1: a 5 micron sediment filter traps dirt, sand, sediment, rust, and silt particles, protecting the carbon filter. Stage 2: special microbiological interception carbon block filter removes chlorine, taste, odors, bacteria, virus, cysts, Lead, and VOCs (volatile organic compounds, like solvents). Designer faucet has a built in electronic monitor with green and red light, that turns red when it's time to change the filter cartridges. Tested and Certified by NSF and BioVir Laboratories. No electricity or booster pumps required. Replace cartridges every 6 months or 2000 gallons. Temperature Range: 40 - 100F. Recommended flow rate: not more than 1/2 GPM. Only $115. Complete Watts WP2-BVC Microbiological Purifier includes both cartridges, top mount designer faucet with electronic monitor, mounting bracket, saddle valve attachment, and tube fittings. Janerotech has greatly expanded upon this technology to bring you greatly enhanced performance on an already excellent product. Another Janerotech Exclusive! 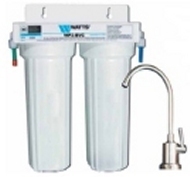 You can easily switch the ordinary 5 micron sediment filter that comes with the WP2-BVC sytem with a high performance Matrikx® Carbon Block Filter for SUPER enhanced chemical, chlorine, taste, and odor removal performance. This will drop the official "certification" status of the system, but will not reduce or affect the microbiological performance. Highly recommended. (# PLUS5) Tolerates medium to low amounts of rust and sediments very well. (# PLUS1) Tolerates low amounts of rust and sediments very well. Another Janerotech Exclusive! After doing modification #1 described above for super enhanced chemical removal performance, you can place a JaneroPure BVC Single Pre-filter Unit with a washable/reusable 5 micron Pleated Sediment Cartridge before the modified WP2-BVC system. This is especially recommended for people with well water or high sediment water to provide the carbon block filters downstream with some excellent protection against premature rust, sand, and sediment clogging. Includes a pleated 5 micron re-usable sediment cartridge. Designed to easily connect to your WP2-BVC filter system. Another Janerotech Exclusive! After doing modification #1 described above for SUPER enhanced chemical removal performance, you can add a JaneroPure SuperNano© Particle Filter before the modified WP2-BVC to pre-filter out incoming particulates such as microorganisms, sediment and rust many times better than any other sediment filter. This ingenious system starts with a Flow-Max© washable/re-usable 5 micron Pleated Sediment Filter, followed by a NanoCeram® nanofilter which will drastically reduce turbidity, cloudiness, and ultra-fine particulates such as microorganisms (down to 0.2 microns in size!) before they get pushed into the microscopic carbon channels of the carbon blocks. The washable-reusable 5 micron sediment filter will greatly protect the special NanoCeram® filter from getting fouled and dirty, significantly improving it's performance and service life. This allows your carbon blocks to work at their maximum capacity and with minimized pressure drop caused by premature clogging. Keeping the microscopic carbon channels clean of this microscopic debris will also keep more "active carbon bonding sites" exposed and available to do their job of removing chemicals and chlorine. This will also lower the "microbiological count" of microorganisms entering the WP2-BVC, so it is in fact, an additional layer of defense. Designed to easily connect to your WP2-BVC filter system.